Most of us are juggling between work and parenting today. And if you’re taking care of a toddler, you always need to have a ton in your arsenal with you. But, more importantly, you also need something to hold all of it. You can find some of the best diaper backpacks that can help you with this. Not only do they store everything for you, but the right one can also become an accessory to your clothing. If you are a new parent, you need to carry numerous things around with you, especially if you take your child out for a few hours. Not only is a diaper backpack handy, but also if you select the right one, it can be trendy and stylish too. Today, you no longer have to make peace with ugly diaper bags that barely complimented your outfit. These days diaper backpacks are stylish, compact and everything else you are looking for. The three best diaper backpacks we will be reviewing today is certainly going to make the cut for you. Read on to know the details about each of these backpacks. If you need a thick and durable diaper backpack, then you will certainly love CROCOD Baby Diaper Backpack. This backpack is easy to clean and can even withstand the rain as it has a water-resistant fabric. It is made from 100% polyester which is durable and will last you for a very long time. In fact, this diaper backpack is environmentally friendly and has been tested through by EN71 and Intertek. It’s available in four colors namely: gray, red, black and black dot. When it comes to the interiors of this bag, there is a ton of storage space available. Altogether, this backpack has 16 pockets. The main compartment in this backpack has the most storage space amongst all. This can comfortably store all of your baby’s clothes, milk powder or even your laptop. The second compartment has tons of pockets to hold on to several items. Within this compartment, there is a hidden pocket with zippers to store your keys, wallet and other valuables. There are also three aluminum foil insulated bags along with a net compartment to hold on to towels, diapers and the likes, as well as a spoon slot. There are two front pockets: two in front of the bag and two side pockets, of which the right one is insulated to keep the bottle warm. If you put things in every pocket of this bag, it will be heavy. Hence, there are comfortable padded shoulder straps with a breathable mesh air panel. Breathable air mesh straps with padding. The stitching on the pockets isn’t too strong. 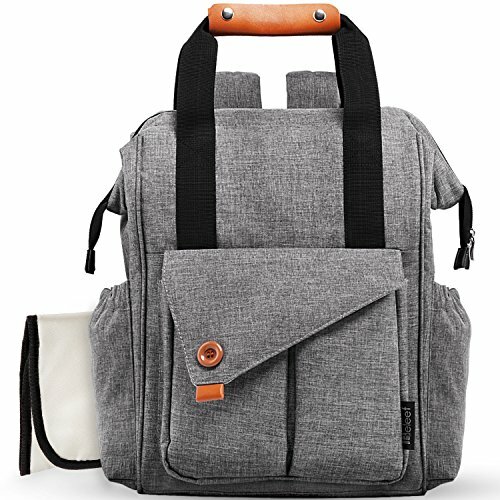 For folks who are particularly looking for a backpack with lots of storage and a trendy unisexual design, then the Beleef Baby Diaper Backpack is what you need. This backpack is available in color gray with black straps and leather brown handle. 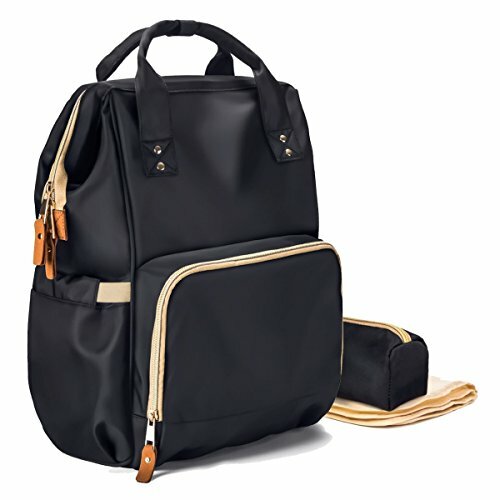 It also has a very stylish design that will pass off as a college backpack. This backpack has 14 pockets in total. They have allotted spaces in the bag for every product so that there isn’t any mess or clutter and everything is organized. This backpack has only one but a large compartment. This compartment has one big mesh pocket to store those diapers and towels, as well as one zipper pocket and two inner side pockets. Furthermore, it has three insulated pockets to keep the bottle warm and four pockets including spoon pockets. There are two pockets in the front too. This backpack is easy to clean and is made out of a durable nylon garment fabric. This fabric is strong and harmless to you and your child. The zippers too are very strong and this backpack is resistant to dirt. It also has baby stroller straps and the back panel on this backpack is a breathable mesh. The company takes pride in the backpacks unisexual design and encourages men and women both to use the bag. In fact, they also recommend using this bag even when you go hiking. Made from durable nylon garment fabric. It can be used as a regular backpack. It has three insulated pockets. It doesn’t have heavily padded straps. 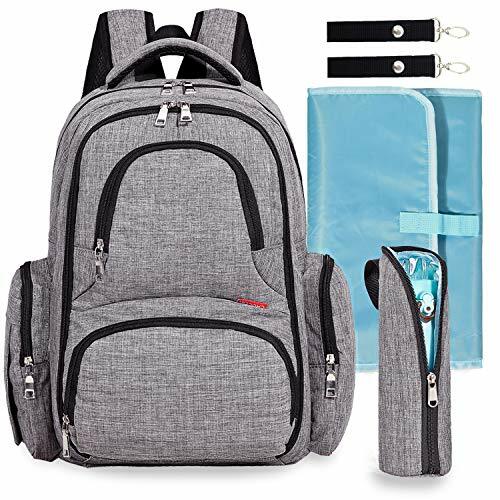 If you are on a lookout for an ultra-chic and trendy yet a perfect baby diaper backpack, then the LNGLAT Baby Diaper Backpack is what you are looking for. This multi-functional backpack is available in color black as well as blue and has a very cool design. It is made out of high quality and environmentally safe materials for you and your baby’s safety. It also has a water resistant feature and is very easy to clean. There is only one compartment in this backpack, but it is very roomy and opens very wide to store all your baby’s belongings and to access them. Each item has its own separate space wherein you can store everything and keep everything organized such as water and milk bottle, diapers, clothes, towels, keys, wallets and so on. There are also insulated pockets and side tissue pockets on this backpack. The company takes pride in the backpack’s unisexual design and encourages both the parents to use it. This backpack is not just built to be used as a baby diaper backpack. It can also be used by a college student or when you go outdoors for a trek or a picnic. The shoulder straps of these bags are heavily padded for your comfort and it also comes with a thermal bottle holder as well as a diaper changing pad. If you don’t wish to wear the backpack on your back you can use it as a handbag. It comes with diaper pad and thermal bottle holder. Not as roomy as the previous two backpacks. Each of the three best diaper backpacks we mentioned above is special in some ways and you will be happy with any of them. However, we have our eyes set on the Beleef Baby Diaper Backpack due to its great design and amazing space.